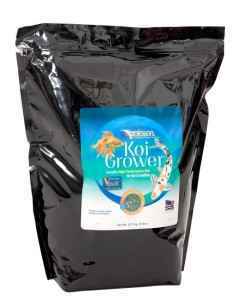 Nijikawa Growth Koi Food is formulated for maximum growth gain and optimal koi health with minimal waste at a fraction of the cost of competing high end koi feeds. Non GMO, Optimized for Ornamental pond koi and designed with Probiotics to clear your koi’s intestines for optimal absorption. Give your koi what they need to thrive, Nijikawa! 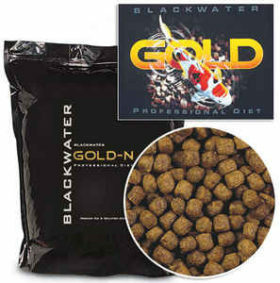 It’s Designed and Formulated by EWOS, one of the largest aquaculture feed companies in the world. 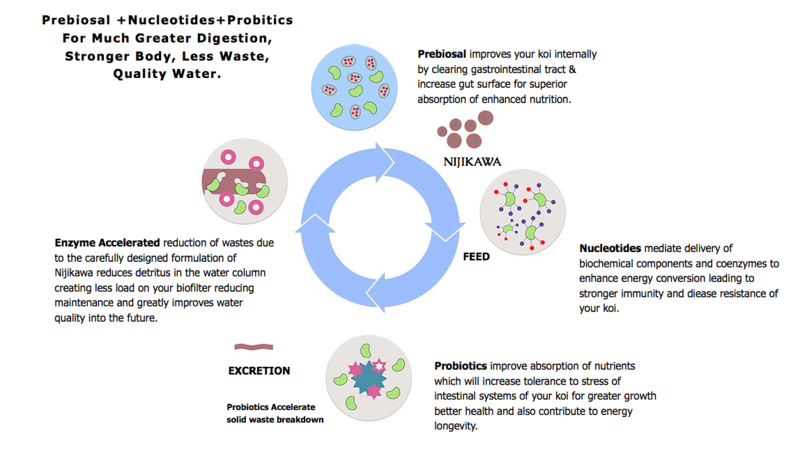 Probiotic Prebiosals help to clear your koi’s intestines cleansing and creating surface area for superior absorption. Excellent absorption rates means much less waste resulting in better water quality. Nucleotides keep your koi healthy at a molecular level. Minerals are important for tissue formation, metabolic function, etc. Ingredients: Ingredients: Fish Meal, Wheat, Poultry Meal, Peas, Dried Beans,Meat Meal, Pea protein concentrate, Fish Oil, Mixed feed Nuts, Canola Oil, Yeast Extract, Vitamin Premix (L-Qscorbyl-2-Polyphosphate, Vitamin E Supplement, Menadione Sodium Bisulfite Complex, Calcium Pantothenate, Biotin, Riboflavin Supplement, Pyridoxine Hydrochloride, Vitamin D3 Supplement, Folic Acid, vitamin B12 Supplement, Vitamin A Supplement, Thiamine Mononitrate), Mineral Premix (Calcium Carbonate Flour, Magnesium Oxide, Ferrous Sulfate, Zinc Sulfate, Manganese Sulfate, Sodium Selenite, Copper Sulfate, Calcium Iodate, Cobalt Carbonate), L- Lysine Monohydrochloride, Nucleotides, DL-Methionine, L-Threonine, Ascorbic Acidand Calcium Propionate. Storage Direction: Store in a cool and dry place. Avoid Direct Sunlight and Excessive Temperature Change. Avoid Wet and Humid Conditions. As the hobby grows, so does our understanding of what the best practices are for handling and caring for our ponds and koi. It is now known that a very large percentage of the problems that occur in your pond come down to the food your feeding your Koi. In the pond hobby, we must be KEEPERS OF WATER as well as KEEPERS OF KOI. Without proper quality of water, we can not expect to have healthy and visually appealing koi. Feeding your koi NIJIKAWA KOI FOOD will help clear the koi intestine thanks to prebiosals in the food which are not digestable, but rather gently move through the gastrointestinal system cleansing and creating more surface area for superior absorption of the balanced protein and fat ratio derived from animal sources that the NIJIKAWA FEED consists of. Better absorption of the food is better for the koi and better for the water because the waste is different after being processed by the animal. 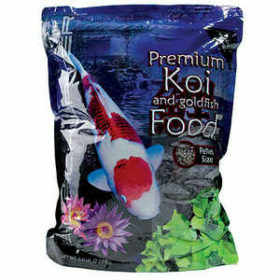 Your koi uses NIJIKAWA KOI FOOD much better than other food because in addition to the animal protein and fat, NIJIKAWA FEED avoids controversial GMO protein sources such as corn gluten meal and soybean protein concentrate. Stabalized Vitamin C and Vitamin E in addition to the prebiosals, nucleotides, probiotics, animal proteins and fats along with NON-GMO plant ingrdients conspire to make your koi assimilate the food much better, creating higher level of health which again assists in better absorption of food which in turn creates a better immune system, color , skin quallity and size which all leads to less waste in the water where the waste that is in the water contains probiotic enzymes and bacteria which clung to the prebiosals as well as having passed through, cleansing your kois gastrointestinal system. NIJIKAWA Koi feed has been established with one idea in mind; “Bring the best possible feed to the community with affordable pricing”. With this idea in mind, we have worked with the most prestigious fish feed manufacturer in the world, with the most advanced research fish feed laboratories and development centers as well as with koi breeders and dealers to create the GROWTH and FOUR SEASONS blends that will enhance koi biosystems and improve koi growth. Quality koi feeds rely on large resource networks, advanced manufacturing facilities, stable supply chains and balanced nutrition which contains all the essential components to support koi life functions. The feed needs to provide optimal protein and fat ratios, enhance the digestive process, stimulate metabolism, strengthen immune systems, improve skin quality and maintain coloration. To acheive such a high level feed requires intensive research over a vast number of available ingredients, experiments and experiences over a large number of samples through multiple aquaculture operations to gather the feedback from koi fish and pond keepers. After years of research and refinement, Nijikawa USA has partnered with the largest fish feed manufacturer in the world (EWOS) to utilize its North America facilities to bring this premium koi food formulation to life. 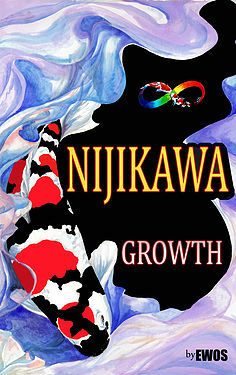 We proudly present NIJIKAWA GROWTH & NIJIKAWA FOUR SEASONS.